As a young boy growing up here in the panhandle, I had heard of this thing called a manatee – but had never seen one. They came more into the light when I was a teenager and becoming interested in marine biology. I was the president of the high school marine biology club and one of our goals was to raise money for a trip to Crystal River to snorkel with them. The Save the Manatee Club originated in that time trying to bring more awareness to the plight of this endangered Floridian and at one point, Jimmy Buffett had led the way. I had learned a lot about them, found out their original range was from North Carolina south to the Caribbean and the entire Gulf of Mexico, but were now down to about 1000 animals and those were found in Florida. Eventually I did get to see manatees, and have snorkeled with them many times, but still thought of them as a south Florida animal – rarely found in the panhandle. Then the recent news report – two dead manatees in the last two weeks. One washed ashore in Okaloosa county and the other in Escambia. Probably victims of the recent cold fronts. It is not unheard of finding manatees in the panhandle in recent years. I recall since the 1990’s a manatee seen in Bayou Texar in Pensacola. In another year, one was seen near Ft. Pickens. My son worked at a local marina and saw at least one a year there. There have been so many seen in the Mobile Bay area that Dauphin Island Sea Lab now has a Manatee Watch program. There are about 40 individuals that now visit Wakulla Springs. In addition, this summer there were two separate groups living in the Pensacola area. One group was residing near Gulf Breeze and a second group of about eight animals was frequently seen near Perdido Key. These once rare animals in the panhandle are now being found each year, and sometimes in groups. 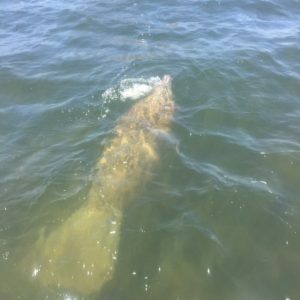 Why are manatees beginning to visit our area? Your first hunch would be climate change. Manatees are marine mammals but unlike their dolphin cousins their blubber layer is not as thick and they must seek warm water refuge during the winter months. When water temperatures drop below 67°F, they locate the warm water springs found in central Florida – or move south Florida where the water remains comfortable year round. If they are remaining here, could the average water temperatures have warmed enough for them to make this move? Along this same line, mangroves are now being found in the panhandle. 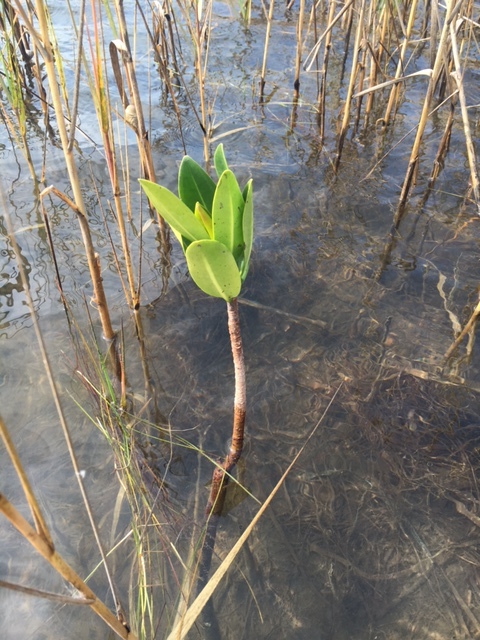 Both red and black mangroves have been found growing in local estuaries. In the Apalachicola area there have been quite a few located. In the western panhandle there a few individuals here and there. Further west they are found on the islands of Mississippi and have been in the Chandeleurs for many years now. Later this spring Florida Sea Grant will be conducting surveys in each county to see where these tropical trees may be growing. And most recently are sightings of snook, a south Florida fish that have, though rare, been seen in the northern Gulf of Mexico. No doubt this Januarys hard freezes probably killed the mangroves that were here, and probably the two manatees washed ashore recently, but it will be an interesting time to see what other tropical species begin their slow migration northward. If it does happen, what will that mean? How will these changes impact local ecosystems? At this point, I am not sure if it will happen or, if it does, how fast – but it will be interesting.